You will find that the digital economy of today is affecting businesses of all sizes. While some businesses are getting disrupted in the process, there are some which are expanding because they are able to adapt to the changes happening around them. How you can deal with the problems arising out of the new scenario is what will determine whether your business will experience growth or disruption. The biggest changes are noticeable in the middles sized companies and small businesses. For them, it is imperative to cope with the changes. At the same time, they must be able to supervise growth while investing with care and ensure that there are minimum risks involved. 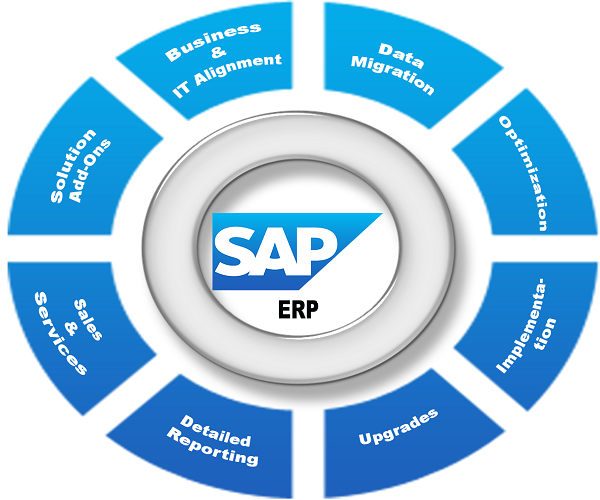 In most cases, the businesses have a pre-set SAP ERP system which lies at the core of their IT set-up. These are integrated with multiple applications in order to handle day-to-day operations. So, whenever there are market changes, it is expected that businesses will be able to respond to them suitably. At the same time, you cannot afford to make the infrastructure any more complicated than it is already. You must ensure that you do not increase the footprint in an attempt to make the business responsive to market changes. So, being able to establish the correct balance between agility and stability is very necessary. Your task is therefore to find out ways to make your existing infrastructure suitable for digital innovations and changes, and further growth in a data-driven environment. Ø Your primary goal is to establish a fool-proof infrastructure. This will be capable of delivering instant value from enterprise data. You can also suitably scale the resources upwards and downwards so that the business grows continually. However, in doing so, you need to be careful about the provider you choose. There are certain offerings which will only add in-memory cache to databases rather than being designed from scratch as 100% in-memory database. The truth is that a valid in-memory platform is fit to manage both analytics in-memory and transactions on a single copy. So, there will not be latencies in data transfers between the application server and databases. In short, businesses can enjoy better data-processing speeds at affordable prices. Moreover, their storage costs can also be cut down. Ø The in-memory platform which can facilitate better response times should ideally combine state-of-the-art databases with advanced data integration and analysis to enjoy a secure single environment for all mission-critical data. When this happens, you can manage colossal amounts of both structured data and unstructured data very efficiently. You can direct this data to the correct people in the business whenever they need it. It is important to realize that the buisness user is also a digital customer. He is going to expect a rewarding user experience. Your clients will want relevant information which is readily available so that they can take quick decisions. Ø To be able to do so, you must inculcate the agility to introduce innovations faster. You should be able to optimize and leverage newer technologies so that your business gets a boost without compromising its stability. For any kind of digital change you need innovations and this is only force which can push your business ahead. So, a flexible platform is going to benefit your business and such a platform should also be able to integrate with existing applications through open standards. Only by ensuring this can you and your business partners come up with newer apps and newer technologies such as automation and machine learning. You can then introduce these into your current business environment without having to drain your funds. Your job is to get all this done as quickly as possible and also at the lowest costs possible. So, you must search for in-memory platforms which can be set up in private secure clouds and which can be accessed by third party vendors. The cloud architecture and managed hosting services provided by them allows you to move your data to the cloud and then scale up resources when you need these. Cloud migration will also enable you to cut down on your IT costs and problems and operational hazards. At the same time, you can enjoy subscription-based payment models.